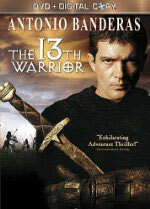 adapted as "The 13th Warrior"
Synopsis: Ahmad Ibn Fadlan, a courtier to the Muslim ruler (the Caliph), is sent to deliver a message to a powerful merchant. As Ibn waits for many hours, the merchant's young and beautiful wife seduces Ibn. The returning merchant turns suspicious of the two and requests that the Caliph send Ibn to serve as ambassador to the north country -- in effect, sending Ibn into exile. Suffering freezing temperatures, the arduous journey takes them to a Viking camp, where he meets the brutal Viking leader, Buliwyf. 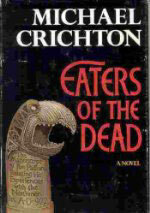 Interrupting the Viking's revelry, the King's son arrives breathless and bloody and tells the group of the massacre of his townsmen by powerful demons. Buliwyf orders his men, and Ibn, to gather their troops and fight the demons. When they arrive at the village of Buliwyf's family, they discover that it has been burned to the ground. They continue to the lavish palace of Rothgar. They scour the area and find that the vicious "wendol" have evaded their search. Buliwyf and Ibn are instructed to kill the wendol mother in the thunder caves in order to stop the carnage. The bloody battle for survival is about to begin. Additional notes: Subtitled "The Manuscript of Ibn Fadlan Relating His Experiences with the Northmen in A.D. 922", the first three chapters are a retelling of Ahmad ibn Fadlan's personal account of his actual journey north and his experiences with and observations of Vikings. The remainder is based upon the story of Beowulf.